Written by Sherrie M. Vavrichek (LCSW-C), this new book is “The Guide to Compassionate Assertiveness,” and I cannot recommend it highly enough. This is a book for anyone who avoids speaking up for their needs. This wonderful book goes well beyond explanations of how to articulate needs and teaches a Buddhist-inspired approach that can improve both the experience of asserting your needs but also the outcomes of everyday confrontations. This book was a wonderful experience to read. I felt better and better chapter after chapter. It cannot be skimmed or read in a hurry. It needs to be slowly read, from the start. It’s relatively short (192 pages), so that’s no chore. It is absolutely packed solid with wonderful concepts. The ah-ha’s were endless. This was new to me, and the concept provoked one of my many ah-ha moments. The idea of the Double Arrow comes from Buddhism. Buddhism refers to the inevitable ups and downs in life by using the analogy of being struck by two kinds of arrows. The “first arrows” are the inevitable problems in life that give us physical and emotional distress, which is generally translated as “suffering” (also referred to as “pain” or “unsatisfactoriness”). Events ranging from getting caught in traffic due to a car accident, to not being invited to a party, to learning about the serious illness of a loved one are examples of first-arrow pain. [...] The second arrows of suffering include overreactions, misguided attitudes or assumptions, misinterpretations, and judgmental reactions related to events that caused first-arrow suffering. The idea is to focus on the first arrow, and steer clear of the second. There are some great stories in the book, which the author uses skillfully to illustrate how the concepts in the book can be applied. The variety of stories is commendable. Many of the stories have before-and-after parts, which works to show exactly how applying humor, compassion, and a light touch all worked out for people. One story describes the conflict between a couple about sharing dinner together face-to-face rather than eating in front of the TV. Another story describes a mother of two children who wants to involve the children more in household jobs and have the children spend less time on video games/unproductive activities. There’s also the story of the one friend who feels overburdened by all of the travel links the other friend sends, which are for places she doesn’t necessarily want to visit. Another story shows the interaction between a customer and a lamp salesman, which shows how the customer ever-so-nicely got the salesman off her back. There are others — across them all a variety of relationships and interactions are covered, from asserting one’s self with a stranger to asserting one’s self with a love-partner, co-workers, parents, in-laws, and others. These principles are explained and referred to again and again in the context of particular confrontations throughout the book–that is, the author not only explains what these principles mean but also shows-and-tells throughout by way of examples. I started to get the hang of these key principles once I had read a couple of examples, and I felt like I had a solid grasp by the end of the book. Part 2 is called Training Your Mind and Your Heart which digs even deeper into the roots of our ideas about other people and communicating with them. This section is a real eye-opener. Chapter 3 is Gratitude: Foster Appreciation to Reduce Negativity, which explains what gratitude means, how it works, and how to foster more of it for yourself. This chapter will pull anyone out of a ‘poor me’ groove. Chapter 4 Equanimity: Stand Firm, Compromise, or Let Go, talks about the Two Arrows of Suffering described above, patience, expectations, pride, and ego and how to work with and against all of them. Chapter 5 Courage: Face Your Fear of Conflict gets into the biology of fear – the limbic system – and how anger and fear function in our bodies and minds. Chapter 6 is Forgiveness: Free Yourself from Anger and Pain, which explains forgiveness (it’s not reconciliation, not forgetting, and not blind trust) and how to achieve it, work with it, and benefit from it. Part 3 is called Strengthening Your Interpersonal Skills, and provides ideas and exercises for increasing your inner calm and for confidence-building. Chapter 7, Using Mindfulness and Meditation to Calm Your Body and Mind, explains what mindfulness and meditation are, how to practice each of them (and includes a sample meditation) and discusses the benefits of both in the context of becoming an assertive person. Chapter 8, Communicating with Care: How to Understand and Be Understood, is a practical chapter that discusses conversation styles, how to listen in order to understand, how to effectively communicate your needs, how to ask for things, and how to express gratitude. It also covers criticism, both giving and receiving it with compassion – and humor. Chapter 9, Using Negotiation Skills to Resolve Conflicts, talks about how to address problems, blending assertiveness with kindness, tips for avoiding the trap of I’m Right/You’re Wrong thinking, dealing with the negative reactions of others, handling criticism and unreasonable demands, and when negotiation doesn’t work. Part 4 is called Applying Compassionate Assertiveness in Love and in Life, which covers various examples of types of conversations/confrontations and digs into their inner workings. Chapter 10 is Compassionate Assertiveness for Couples and takes a look at communication issues that couples typically experience, differences between male and female approaches to relating to their needs, and includes guidance on applying the four core principles explained in Part 1 to asserting needs with a love-partner. Chapter 11, Compassionate Assertiveness with Your Family, covers talking with one’s parents, talking with one’s children, as well as how to use those conversations/confrontations to foster greater understanding and stronger bonds. Chapter 12, Compassionate Assertiveness in the Outside World covers confrontations with friends, strangers, and co-workers. This chapter brings it all together, discussing the everyday kindnesses and compassion that can exist, and why each of us should take part in fostering it. If the concepts and ideas summarized here resonate with you, this book will surely speak to you. It’s a special book, and it really did feel great to read it. 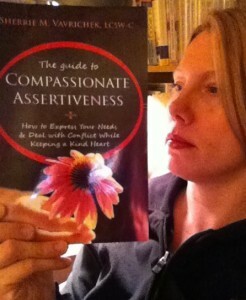 You can grab a copy of The Guide to Compassionate Assertiveness here. I just ordered the book! Sounds promising–thanks for the recommendation. Ooooh, I’d love to hear what you think of the book. PS: I’m going to be interviewing the author of the book on a new Blog Talk radio show…I’ll post the date once it’s scheduled. So are you enthusiastic, discerning, or open-minded? I am discerning/open-minded (my quiz yielded a tie). Still in the first section of the book, but I’m loving it so far! For me it was a tie between enthusiastic and open-minded. Amy!!! This book is wonderful! It is helping me so much–love that it’s full of tangible techniques that I can actually use. Thanks again. Isn’t it great? It’s a really unique approach…wholly do-able. In the 70′s assertiveness training came forward. I either couldn’t find the right place/time to formally take it; so I had to hone my style of communicating myself. A great book on ‘Boundaries’ also played a big role for me. Talking has never been a problem with me. But assertiveness has. I did study and became a speech therapist! Assertiveness training is so important. So good to see it on line. Thanks. I’d love to know what the ‘Boundaries’ book was, if you remember its title..